Livestock mortality is an issue faced by every livestock farming operation, both large and small. 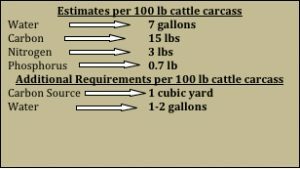 For many producers, carcass disposal options are limited, can be costly, and may temporarily disturb the land needed for grazing. Improper disposal of dead animal carcasses and the resulting leachate (carcass fluids) can negatively impact surface water and groundwater quality. If the animal died of an infectious disease, pathogenic bacteria and viruses may be present inside the carcass, thereby increasing risk of disease transmission. Additionally, state regulations exist regarding the proper disposal of livestock mortalities. 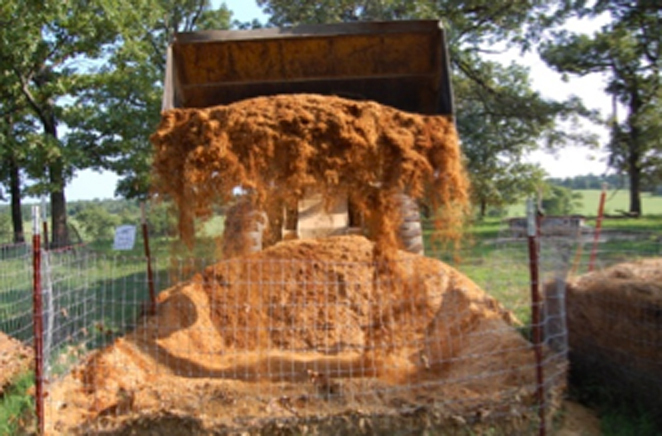 Oklahoma State University (OSU) Extension fact sheet BAE-1748 provides information about these regulations and the state approved methods for livestock carcass disposal, which include: burial, rendering, incineration, composting and landfills. Table 1 lists the criteria that determine the acceptability and desirability for each carcass disposal method. Table 1. Goals of carcass disposal. One state approved procedure that livestock producers may not be familiar with is composting. Properly managed composting fulfills each of the desired goals established in Table 1. By definition, composting is a controlled biological decomposition process that converts organic matter into a stable, humus-like product. Extension fact sheet BAE-1744 describes the basic process of composting. 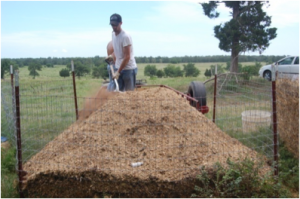 While backyard composting systems have a well-blended mixture of components (carbon and nitrogen), which results in a rapid compost cycle, livestock composting is a slower process. Composting livestock carcasses is characterized by the break down of a large centralized nitrogen source (carcass) that is surrounded by a carbon source (bulking agent). This system requires an initial breakdown of the soft tissues on the exterior of the carcass, followed by thorough mixing to promote an ideal blend of carbon and nitrogen for effective composting. These four aspects determine the efficiency of the livestock composting system and are controlled by the bulking agent. The correct bulking agent provides the proper C:N ratio needed to successfully compost the carcass while ensuring adequate oxygen levels, maintaining ideal moisture and promoting heat retention. The bulking agent also contains any leachate and odors produced during the process, therefore acting as a filter between the carcass and the environment. Microorganisms will degrade the carcass leaving only a few small bone fragments, which are brittle and break easily. This valuable by-product can then be land applied as a fertilizer source, adding nutrients and organic matter to the soil, or reused for additional carcasses. The high temperatures (130 F to 150 F) achieved through proper composting will destroy most pathogens and weed seeds. Table 2 illustrates mortality losses of livestock in Oklahoma and the potential impact of mortality compost nutrients if land applied. Table 2. Annual Oklahoma cattle and calf death loss and carcass nutrient data. †Based on a conservative value of $0.35 per pound of N as Urea. *This does not include the added value of increased organic matter, Ca, P, K or other nutrients. §National Death Loss Survey, USDA. 1996-2005. ‡Livestock Marketing Information Center, LMIC. 1999-2008. ΩNational Stocker Survey, BEEF. 2008. One of the more important aspects of macro-composting is careful site selection. An ideal location for an exposed compost pile is an elevated site sufficiently distant from bodies of water and neighboring properties. The site should be located in an area that does not pose a risk to surface water or groundwater contamination. 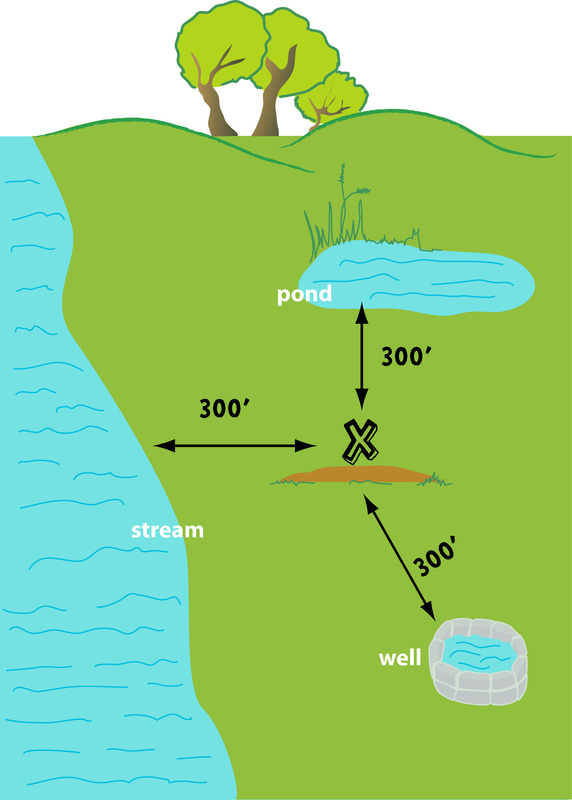 Figure 1 illustrates the proper placement of a compost site with respect to distance from water bodies. Exposed sites tend to get adequate airflow, but can be affected by local climate and weather patterns. Excessively dry or wet conditions may decrease compost efficiency. Picking an elevated site is desirable to reduce the risk of perched water tables and groundwater contamination. Site slope should be kept to a minimum to discourage excessive erosion around the pile and possible runoff. Figure 1. Site selection for composting. A barrier wall or fence is optional but does present some advantages during the composting process. 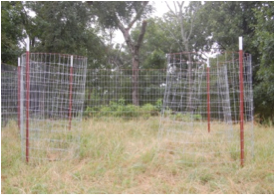 At the very least in their design, barriers should guard against physical intrusion from livestock and predators, while restricting movement of carbon material. Barriers do not need to be elaborate or expensive. One inexpensive, yet effective approach is to construct a bin using 4 feet high field fence supported by four steel t-posts (Figure 2). Barriers can also be constructed permanently with a concrete floor, treated wood walls and a metal roof. The design is the producers’ choice, but it should be based on the number of animals to compost and the investment level desired. Unrestricted piles must be sloped from the base to the peak much like a pyramid. However, using a barrier will contain the bulking agent depth in a smaller footprint, reducing the amount of C material required. This is an economical benefit that can recoup the cost of barrier construction (See Figure 3). Other options include old pallets, round hay bales or cattle panels. Figure 2. Bin constructed from steel t-posts and net wire. Figure 3. Proper pad design and carcass placement when composting livestock, as well as the potential reduction in required bulking agent when utilizing a barrier. The bin foundation is not as important to the process of composting as to the ease of maintenance on the piles. Foundations range from the ground itself, to pallets, gravel and concrete. Again, the option is completely up to the producer. Using bare soil is acceptable if proper site selection was implemented, and the carbon pad beneath the carcass is of adequate depth to contain carcass leachate. Concrete, on the other hand, makes a very nice permanent foundation that is easy to clean and maintain. Consideration should be given to the method of aeration, since foundations of gravel, pallets, etc. may prove to be difficult to mix and turn with equipment. A C source, preferably with a high C:N, must be chosen before construction can begin. Table 3 lists common C:N ratios for various compost materials. The C source is the “filter” between the carcass and the environment. Therefore, choosing the right carbon source is vital to the success of the livestock composting system. Sources of carbon should be easily obtainable in the local area. Any woody, stemmy or fibrous material usually makes a good C source. 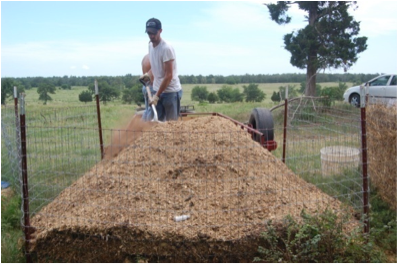 Common options are wood chips, shavings or sawdust, hay, straw, corn stubble, chipped tree limbs, rice hulls, etc. These all have moderate to high C:N ratios that when added to the nitrogen rich carcass promote efficient composting. Select C sources that are fine to medium in porosity for optimum efficiency. Particle size is important in regulating air flow. Too much airflow can cool and dry out a pile, while too little airflow can inhibit oxygen availability, both of which can cause microbial activity to slow. Coarse sources, such as long-stemmed wheat straw, have poor thermal efficiency and allow excessive moisture to escape the pile. When dealing with these types of C sources, such as hay or straw bales, prior weathering or grinding is recommended. Another recommended option is to incorporate manure with the selected C source. This addition can help to reduce the porosity and further homogenize the C:N. Note: If poultry litter is used in the compost mix, Oklahoma state law requires that it be covered overhead or surrounded by a compacted soil berm to prevent litter movement. Table 3. Common compost materials. 1On-Farm Composting Handbook, Agriculture, and Engineering Service, NRAES-54, Natural Resource, Ithaca, New York. 2Compost Materials, 1996 EBAE172-93, North Carolina Cooperative Extension Service, Raleigh, North Carolina. For single calves up to 800 lbs, a foundation and pad built 8 ft2 is sufficient. If there is a possibility of composting mature cows, this footprint should be increased to 10 ft2. The C pad is a very important feature in the composting process. Therefore, certain design rules should be adhered to. The roles of the C pad include providing thermal insulation from the foundation, a “filter” to absorb and contain carcass leachate while preventing its entry into the environment, and a carbon source for composting occurring at the bottom of the carcass. Therefore, the ideal pad should be 18 inches in depth for fine particle sources (shavings, rice hulls, etc.) and 24 inches for coarse particle sources (straw, corn stalks, etc.). The carcass should be placed on the center of the pad. The head and legs may need to be tied with baling twine to avoid obtrusion through the pile (Figure 4). Once the carcass is placed on the pad, an incision should be made along the abdominal cavity, puncturing and deflating the rumen. If this procedure is not performed, the rumen can swell and rupture causing a portion of the pile to collapse. A further option is lancing the large muscle groups and opening the body cavity, exposing the internal organs. This procedure allows microbial access to the interior of the carcass and upon addition of the C source, speeds up decomposition. The bulking agent used for the pad and cover should contain approximately 50 percent moisture by weight. If using a dry bulking agent, water should be added. Pond water works well because it contains an abundance of microorganisms. As a rule of thumb, the bulking agent should be moist to the touch, but you should not be able to squeeze out drops of water. If piles are too dry, microorganisms may die or remain inactive, resulting in cool piles with slow decomposition rates. If conditions within the pile are too wet, airflow is limited and oxygen availability is reduced, potentially leading to foul odors. Figure 4. Carcass placed in center of the pad with head and legs tied to avoid obtrusion. Figure 5. Carcass surrounded with at least 18 inches of bulking agent. The C cover performs similar functions as the pad. As such, maintaining a thickness of at least 18 inches for fine particle sources and 24 inches for coarse particle sources will meet the desired goals. These goals include reducing odors to minimal or nonexistent levels, providing sufficient C for composting above and later inside the carcass, and in some cases providing a “cap” to shed excess rainfall. Yet, the cover plays the largest role in the efficiency of the decomposition process. Since heat rises and also carries moisture, the cover insulates the core from temperature loss and resultant moisture loss. Maintaining an adequate C cover thickness of ideal porosity is the key to optimum livestock composting. In rainy areas, piles should be designed with steep crowns to shed rainfall. 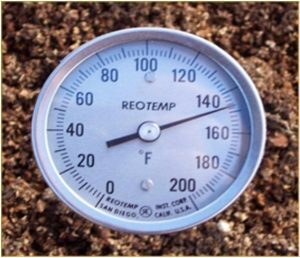 Internal pile temperature should be monitored using a long-stem thermometer throughout the composting process (Figure 6). The pile should begin to heat within the first day or two, transitioning from the moderate to high temperature phase. Internal pile temperatures should reach more than 130 F. This is due to the metabolic energy produced by the active microorganisms. Over time, the microorganisms consume the available soft tissue, carbon and oxygen within the pile. As microbial activity decreases, the temperature within the pile begins to drop, thus entering the cooling phase. This process may take one month to five months depending on climate, C source, etc. Opening the pile too soon may lead to an undesirable release of foul odors. Once the temperature drops 30 F below maximum temp, or below 110 F, it is time to turn the pile. Figure 6. Long-stem thermometer used to monitor temperature. Using a front end loader, turn the pile while mixing the remaining carcass and bulking agent. Introduce new oxygen by cascading the bulking agent from the loader into the pile (Figure 7). Assess moisture levels to determine if water should be added. Make sure all carcass parts are once again covered with adequate bulking agent depth. 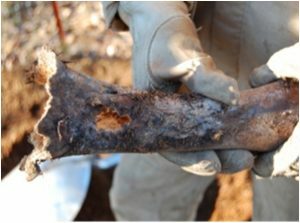 A similar rise and fall in temperature should occur as active microorganisms decompose bones. If properly managed, the pile should begin to enter the curing process. At this point, the producer can decide to land apply the compost as a valuable fertilizer source or aerate the pile again to further cure. The finished compost can also be recycled to seed the new pile with microorganisms or used as a bulking agent with new mortalities. Any remaining large bones should be brittle and break easily (Figure 8). If desired, they can be added to another compost pile for further decomposition. Figure 7. Turning the pile with a front-end loader. Figure 8. A hollow, brittle femur bone following 150 days of composting with pine shavings and poultry litter mixture. Since all producers may not have access to a long-stem thermometer, it is beneficial to have a timeline for correct pile management. 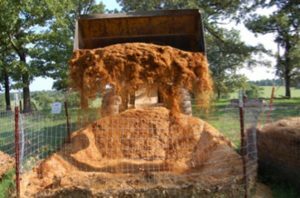 OSU research on livestock composting has shown that by 75 days after adding a carcass, the first heat cycle is ending, and it is recommended to turn the pile. Following proper aeration, the second heat cycle will be completed in an additional 75 days. Final turning and aeration can be performed at this time. Compost piles should not be turned any sooner than this, as these guidelines are minimum time requirements. Other factors that can lengthen turn times include cool winter temperatures, which slow the decomposition process, and larger carcasses, which require a longer decomposition time. 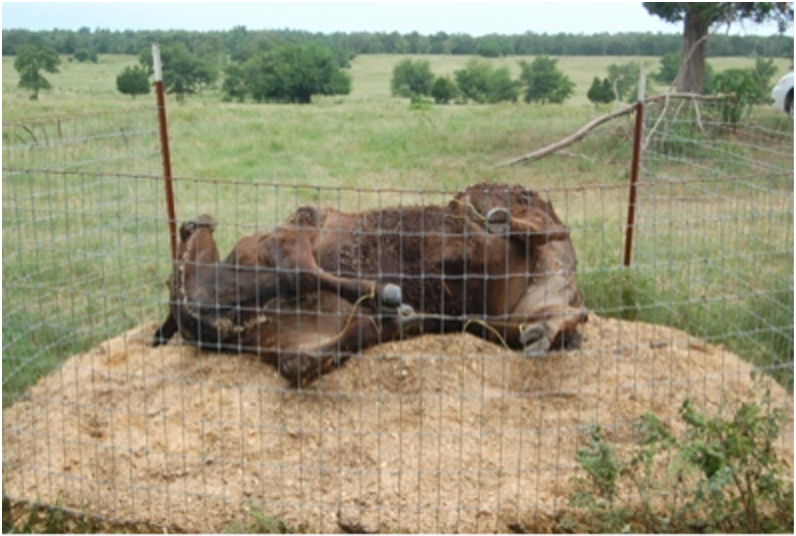 An OSU field study conducted in southeast Oklahoma, near Stigler, compared three bulking agents for composting stocker calf carcasses. The treatments consisted of pine shavings (S), a 50:50 mixture of pine shavings and poultry litter (S&L), and hay (H). Each treatment was replicated four times, and piles were turned on days 75 and 150. 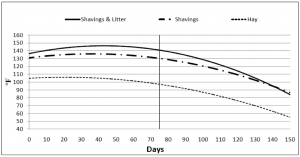 The findings indicated that S, S&L and H treatments were all effective at decomposing stocker calf soft tissue over a 150 day period. Shavings and S&L treatments formed a humus-like product and were more effective at decomposing bones when compared to the H treatment. Additionally, S and S&L treatments maintained sufficient temperatures required for effective pathogen reduction or elimination, while H treatments lost heat and moisture due to a higher porosity (Figure 9). Figure 9. 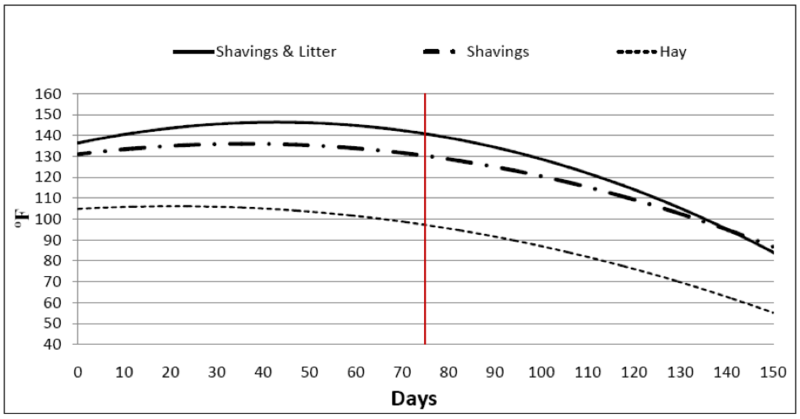 Temperature variation over time of pine shavings and poultry litter mixture (S&L), pine shavings (S) and hay (H) compost piles each containing a stocker calf. When composting multiple livestock mortalities, establishing windrows of bulking agent is recommended due to the increased quantity of carcasses. Site selection and pad width and depth should follow previous bin construction recommendations. However, pad length and carcass placement differ slightly. 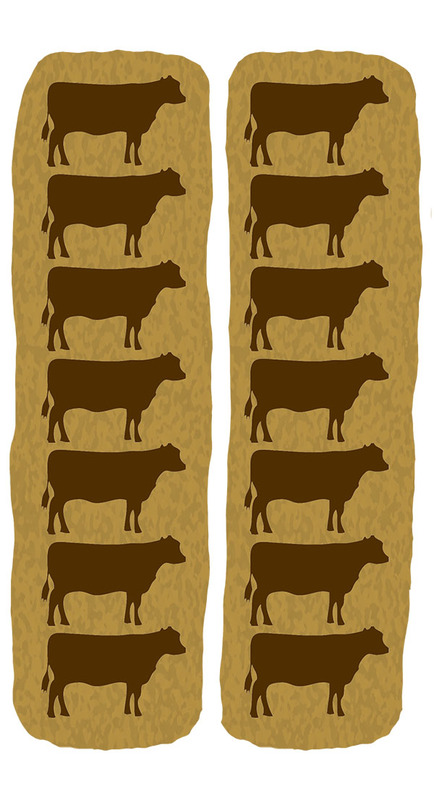 The back of one carcass may rest on the legs of the adjacent carcass as illustrated in Figure 10. Assure 24 inches of space from the carcass to the edge of the pad. Providing a fence structure may not be feasible. Therefore, properly covering the carcass with 24 inches of bulking agent is essential to prevent scavenger invasion. The length of the pile is dependent on the number of mortalities to be composted. Pile management should follow similar recommendations as previously outlined for bin structures. Figure 10. Windrow composting for multiple mortalities. Construct barrier and base at chosen site. Prepare carbon pad at least 18 inches deep. Place animal in center, ensuring the carcass is at least 24 inches from the pad edge. If necessary, use baling twine to hold legs and head in position. Lance rumen to deflate gas buildup. Add water to carcass and pad until C source is damp but not wet. Finish with at least 18 inches of carbon cover over the entire carcass. For exposed piles, form a steep peak to shed excess water. After 75 days, the first heat cycle should be finished. Turn the pile while mixing and aerating the carbon material. Large bones should remain in the core of the pile. After 150 days, the second heat cycle is nearing completion. Turn the pile again to further cure. Remaining bone fragments should be brittle but can be placed in the next pile for complete decomposition. Land apply the material as you would fertilizer or use to compost additional carcasses. 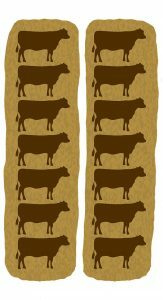 Sustainable livestock production requires proper management of on-farm mortalities regardless of farm size. These methods should adequately dispose of animal carcasses without negatively affecting the environment, while also remaining economical to the producer. When properly managed, composting livestock mortalities is a safe, effective option for producers to consider, while producing a valuable soil amendment.